5 acres land and home for AUCTION on 5/15/2019 in Wharton, Texas. 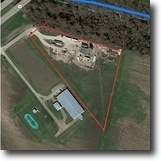 34 acres land and home for AUCTION on 4/22/2019 in Bryan, Texas. 4 acres land for sale in Glen Rose, Texas.